Video: We discuss the story with Gina Ramirez, a member of the Southeast Side Coalition to Ban Petcoke and senior program assistant at Natural Resources Defense Council; and reporter Alex Ruppenthal. With her young daughter a few seats away, Southeast Side resident Liliana Flores approached the microphone to address a panel of public health officials about high levels of neurotoxic manganese discovered in her neighborhood. About 100 residents packed a Southeast Side community center for the first public meeting on manganese exposure since the city became aware of the issue in 2016, and nearly one year after the U.S. Environmental Protection Agency cited S.H. Bell Co. with violations of the Clean Air Act for releasing high levels of manganese dust into the neighborhood. Holding signs that read, “S.H. 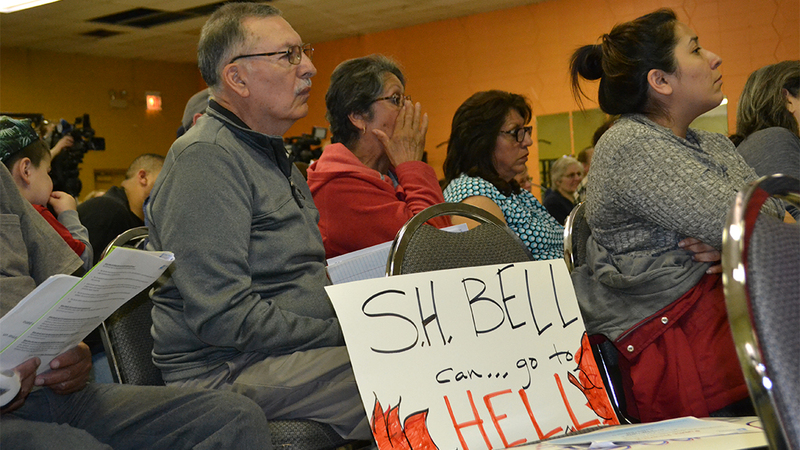 Bell can … go to HELL,” “No Manganese AQUI!” (“No Manganese HERE!”) and “I Can’t Breathe!” residents expressed outrage over what they said has been a slow response to their concerns about manganese, a heavy metal used in steelmaking that can cause Parkinson’s-like symptoms at high exposures. Their fears were heightened last week when details surfaced about testing conducted by the city that showed high concentrations of manganese in soil throughout the area, including samples from three properties with levels in excess of the EPA’s emergency removal threshold for manganese, which is 5,500 parts per million. On Thursday, officials provided more details about the testing, revealing that the most contaminated sample measured at 13,000 parts per million, more than double the EPA’s emergency removal level. Of the 27 properties tested by the city, 20 showed manganese levels higher than a more restrictive screening level of 1,600 parts per million used by the Illinois EPA, according to the city. The EPA now plans to conduct its own testing in the neighborhood, with the goal of collecting soil samples from 70 properties. Officials said the agency would finalize a testing plan next week, and that it would take about three weeks to analyze samples once they are obtained. Based on the results, the agency could then decide to dig up and replace soil at highly contaminated yards. “We’re looking at areas where it’s most likely that the dust would have been deposited,” said Steve Faryan, EPA’s coordinator for the project. In light of results from the city’s recent soil testing, CDPH Assistant Commissioner Dave Graham said residents should take several precautions to limit their exposure, such as taking off their shoes before entering their homes and cleaning floors and countertops regularly to remove dust that could contain manganese. Any soil should be covered with grass, mulch or wood chips, and residents who garden should use raised beds, Graham said. Residents should watch their kids when playing in the dirt to make sure they don’t eat from the soil, he said. Officials said residents concerned about their exposure to manganese should speak with their doctors. Several residents pushed back, saying that they addressed the topic with their doctors but did not receive any answers. In such cases, CDPH officials said patients should have their doctors call 312-746-6621 so that the department can provide referrals to environmental and occupational health specialists, such as those at specialized clinics at Stroger Hospital and UIC. About 20 people spoke during the meeting, and when a resident asked whether a representative from S.H. Bell was at the meeting, no one responded. At least three other facilities in the area handle manganese, though only Bell has received violations from the EPA for its release of manganese dust. One problem facing regulators is the relative lack of research about chronic exposure to manganese, especially in children, said Michelle Colledge, environmental health scientist with the federal Agency for Toxic Substances and Disease Registry. A recently published study of children in Ohio found a significant link between higher concentrations of manganese in hair samples and declines in IQ, mental processing speed and working memory. But studies that examine hair, toenails or other samples are not always consistent with actual markers of exposure to the brain, Colledge said. Chicago has taken several steps to address manganese dust since the issue began receiving regular attention last year, though residents and environmental advocates say the efforts fall short. An ordinance approved in late March by the City Council prohibits new facilities from storing or handling materials containing more than trace amounts of manganese. Companies that currently handle manganese will be required to file quarterly reports showing the amount of manganese shipped and received under the ordinance. CDPH has also proposed amendments to the city’s Bulk Material Regulations that would give the department the ability to require filter-based monitors at facilities that handle manganese and other heavy metals, giving officials a way to measure dust emissions that could pose risks to nearby residents. During Thursday’s meeting, CDPH announced plans to test soil around other manganese-handling facilities on the Southeast Side, in addition to air sampling in the neighborhood. The department has also requested that the Agency for Toxic Substances and Disease Registry conduct an “expeditious review” of health risks from manganese exposure for area residents, via inhalation and/or contact with contaminated soil. But residents and environmental advocates want the city to issue a temporary moratorium on manganese operations until officials have a clearer picture about the health risks to the community. Note: This story was originally published May 11, 2018.